I'm trying to gear up for an interview with Jim Steranko. There's stangely little written about him, so doing background research involves finding little tidbits here and there. But thanks to my father, the magician, he's loaned me perhaps one of the most intimate recorded looks at the man. It's actually the November 1962 issue of Genii, the conjurers' magazine. It's very clearly labeled on the front: "Steranko Issue!" (Including the exclamation point.) 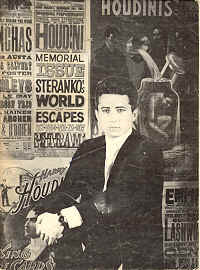 Most of the focus is a series of articles Steranko himself wrote on about a number of card tricks, but it does have a few other pieces about him as well. Certainly, this will be useful background info since it predates any fame he garnered as a comic artist. I was talking to my dad on the phone and he explained that it was amazingly unusual for a magician to appear on the cover of Genii more than once. Siegfried and Roy only made it once. David Copperfield only made it once. But he had this strange recollection that the first time he saw "The Steranko Issue" it had a silverish cover. But when he dug up his copy, it was just a headshot of Steranko. Apparently, he was just THAT good of a magician that he did make it to the cover of Genii twice. And you thought he was just THAT good of a comic book artist! Whatever ego he may or may not have, it's little wonder where it may have come from!